This topic contains 388 replies, has 97 voices, and was last updated by wrd1972 1 day, 12 hours ago. I’m LATE to the party….just a fantastic table. I just blew through 3 hrs on it. I get here and realize there’s even more coming soon…yeow. I’ll be watching this one. Great work! Could this be the weekend??? One last PITA issue to resolve with the subway. This reply was modified 2 months, 3 weeks ago by wrd1972. NOTE: You MUST use VP10.6 BETA for the table to work. NOTE: Required ROM is now 906H. Nice upgrade wrd, Thanks! Everything seems to work flawlessly here. Can’t wait for the final version! As for the improvements, there seems to be aliasing issues around the edges of insert lights that weren’t an issue with your older version. 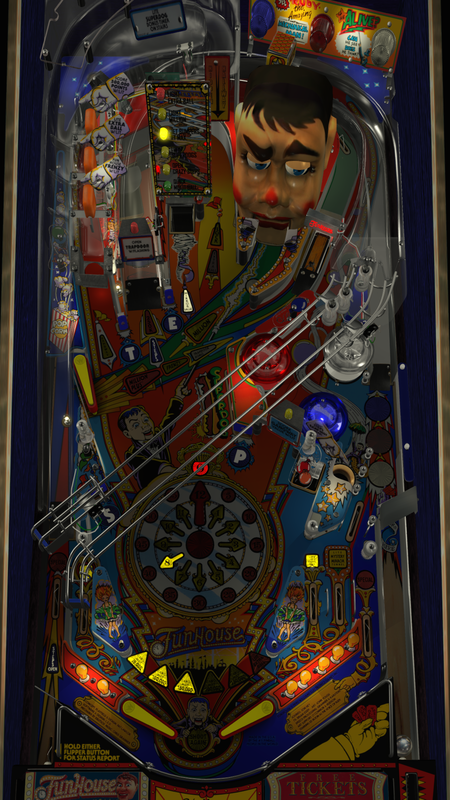 Problem seems to go away if I replace the playfield image with the old one that doesn’t have cut out holes where inserts are. Also (and this might just be a personal preference, mind you), I’d like the insert lights’ intensity value to be set to a much lower value so it wouldn’t drown away the texts. One trick is using a darkened version of playfield texture on insert lights. It gives you a much more wider dynamic range, meaning no crushed colors on lights like below. My latest TOTAN mod is a good example of this. Also, ball shadow is missing. Otherwise, amazing as usual! This reply was modified 2 months, 3 weeks ago by Skitso. @skitso @wrd1972 the aliasing problem I think it’s caused by the PFTextBlack2xcf image over the inserts, not perfect, but I tried to soften a little the edges, try the attached file if u want. Anyways with Quality FXAA and Forxed 4x SSAA enabled, on a 1080P monitor, I can’t see it so pronounced. And for my taste the ballon texture is too much clear, I did it a little more opaque version. Super nice update, now I returned to the old one to play a few games, and I missed a lot all the new changes. This reply was modified 2 months, 3 weeks ago by Draifet. Okay I did some fixing on the jaggies around the clock. Also fixed the balloon issue. Definitely has some weird stuff going on with that image. The defects were clearly visible on the image in VP. But they did not show up in Gimp. I ended up just erasing where the defects appear, and it does loo better now. Also tweaked the balloons. Anybody see anything else or have any other concerns? Try to place the image in front of a black background. I saw leftovers from different colours in one of your earlier betas. Dunno if you already fixed that. Just added the coin sound and ball shadows. Consider adding “Target” too. It is in the table script but missed as a sample. Should add – plays very well – lots of fun ! Its called fx_target. Its in there and appearing in the script. So I think I am good there. Not sure why coin disappeared though. Really ? Are we talking about FH_WIP56.vpx ? Also a little strange to play that sound @ misc – ActiveBall would be nice to use. I find that fx_target and it seems you use a collection. That playsound has 8 parameters, not 9. I guess that is what you use and ignore the missing “target”. Which is fine I guess. I also noticed something strange. But maybe I need to delete my nvram ?! DMD said to watch the hideout for ball eject two games in a row. Instead a ball was ejected to the plunger. Game ended when I still had one ball in play. I will look again. But the targets are in a collection and the collection is tied to fx_Target. I still need to clean that mess up a little it appears. Yeah I saw the weird thing with the hideout once or twice too. It did not appear to be very common, and I would not really know where to start with that one. lets try deleting the NVRAM and see what happens. Yeah – I didn’t notice at first that you’ve put them into a collection. The way it is now, it just constantly tried to play that sound without finding it. I’ve always wondered if that could have any performance impact at all. I guess it doesn’t because there is huge amount of table that has old references to sounds that isn’t there. I also had the game end with one ball in play. Something must not be right. I find it hard to believe that’s an nvram issue. I started a few games with the other “home” rom and I had no issues. Coincidence ? Probably, but, can’t hurt to try. I had lot’s of troubles getting the table to work with a rom downloaded from VPU. On the other hand, the one I downloaded from the VPF seems to work without issues. Like MAME, roms can be stored and distributed as “split roms”. If you download a clone set then you also need to download the parent set (usually the final production code for on-route machines) to get full working game code. VPU has a mostly complete collection. If something is missing then post a report there.